This morning, six promising early stage commercial buildings technology companies were announced as the second cohort of the Wells Fargo Innovation Incubator, IN2. IN2 is a five-year $10 million program funded through the Wells Fargo Foundation and administered by NREL. The program provides selected companies up to $250,000 in technical and business assistance, in order to test and validate commercial buildings technologies in the lab, in the field, and potentially in real-world test conditions, including the Wells Fargo’s building footprint. The program began in 2014, with the selection of 4 Round 1 awardee companies. Initial projects are well underway with technologies incubating at NREL- with the support of top tier researchers and facilities. The IN2 program is excited to engage with the next round of companies, and provide the opportunity to further advance these technologies. 7AC Technologies in Beverly, Mass. (Referred by Cleantech Group and MassChallenge) has a proven Liquid Desiccant Air Conditioning technology; which reduces electricity and potable water consumption for cooling and heating by 40% compared to existing best-in-class solutions. Go Electric Inc. in Anderson, Ind. (Referred by Clean Energy Trust and Hawaii Energy Excelerator) is developing customer side of the meter energy solutions and services. Go Electric’s patented LYNC micro grid and uninterruptible power system technology delivers energy cost reduction to buildings 24/7 and dispatches utility demand response with no inconvenience to facilities. Heliotrope Technologies in Alameda, Calif. (Referred by NREL Investor Advisory Board: Prelude Ventures) is developing a low cost, highly functioning electrochromic smart window technology utilizing unique solution-based manufacturing processes. NETenergy in Chicago. (Referred by Clean Energy Trust ) is a thermal energy storage (TES) company, whose module integrates with small commercial building air conditioning systems to shift energy demand and consumption to off-peak hours. Polyceed, Inc in Encinitas, Calif. (Referred by Cleantech Group) is developing novel low-cost smart materials whose optical properties can be changed in a predictable and controllable manner. The technology has broad applications from dynamic smart windows to displays and wearable consumer devices. ThermoLift Inc. in Stony Brook, NY. (Referred by Cleantech Open, NECEC, Cleantech Group) is developing a natural gas-driven heat pump and air conditioner to replace building heating, cooling, and hot water systems with a single appliance; providing a 30-50% reduction in energy consumption and emissions. Applicants were first referred to apply to the program through a channel partner network of 29 national incubators, universities, and research institutions. Companies went through a rigorous down-selection process, with three independent selection committees reviewing and scoring applications utilizing distinct criteria. NREL technical experts reviewed applications for technical merit and potential energy impact, followed by a judging process by a Wells Fargo internal IN2 Board of Directors, which viewed applicants’ business models and market potential. Finally, an External Advisory Board ultimately determined the 6 companies to invite to Round 2 of the program. 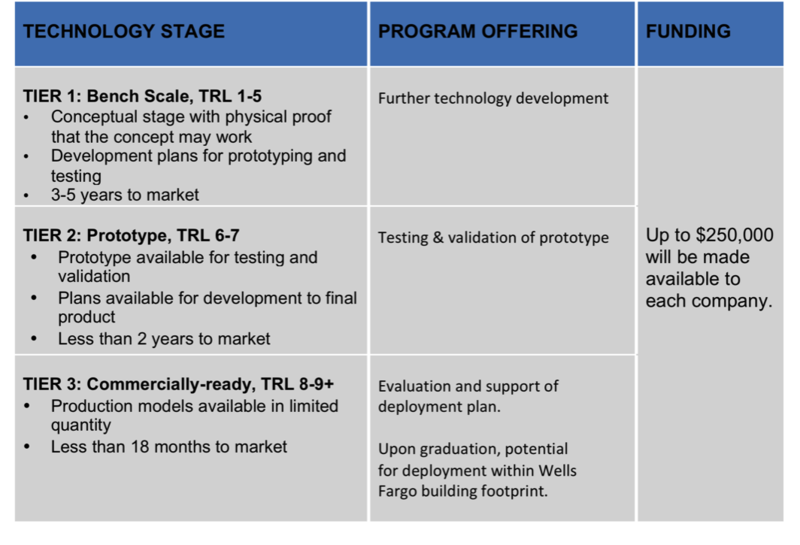 Companies eligible for IN2 fall into three tiered categories based on technology readiness, Tier 1 (bench-scale), Tier 2 (prototype), and Tier 3 (commercially ready). Technical projects for awardees will vary based on their tier, specified in the below matrix. Companies invited to the second round of the program span all three categories. The IN2 team is excited to partner with these companies and help provide them with the needed support at their current stage of development. Stay tuned for updates as Round 2 technical projects get under way. Learn more about the Wells Fargo Innovation Incubator here.